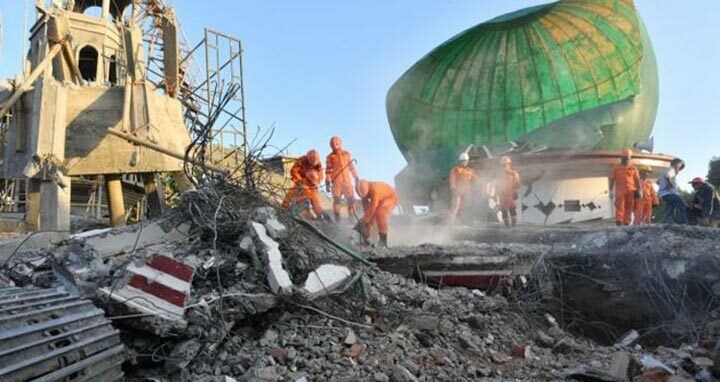 Dhaka, 9 August, Abnews: The Indonesian island of Lombok was shaken by a third big earthquake in little more than a week Thursday as the official death toll from an earlier quake topped 300. Videos showed rubble strewn across streets and clouds of dust enveloping buildings. In northern Lombok, some people leaped from their vehicles on a traffic jammed road while an elderly woman standing in the back of a pickup truck wailed "God is Great." An Associated Press reporter in the provincial capital Mataram saw people injured by the tremor and a hospital moved patients outside. Wiranto, Indonesia's top security minister, told reporters the death toll from Sunday's magnitude 7.0 quake had risen to 319. The announcement came after an inter-agency meeting was called to resolve wildly different figures from different agencies. Grieving relatives were burying their dead and medics tended to people whose broken limbs hadn't yet been treated in the day since the quake. The Red Cross said it was focusing relief efforts on an estimated 20,000 people yet to get any assistance. He also said they're continuing to look for people with untreated injuries. In Kopang Daya, injured villagers got their first proper treatment Thursday after medics arrived with a portable X-ray and other supplies. They tended to an elderly woman with an injured face and hips who'd been knocked over by her grandson as they scrambled from their house.